Arthritis is not just comprised of minor aches that come with age. For the approximately 1.5 million Americans living with rheumatoid arthritis (RA), it means dealing with a systemic inflammatory disease that causes pain, stiffness, swelling, and possibly joint damage. When the condition flares up, people can become almost completely incapacitated. While there is no cure for RA, it is possible to make dietary changes that can help reduce flare-ups and ease symptoms. One of the major causes of joint inflammation is the enzymes cyclooxygenase-1 (COX-1) and cyclooxygenase-2 (COX-2). Anti-inflammatory medications in the nonsteroidal anti-inflammatory drug (NSAID) family, such as Aspirin, can block COX activity. However, there are a number of nutrients naturally found in foods that also show similar behaviors. Omega-3 fatty acids have been shown to have modest, but consistent success in reducing inflammation for people with RA. They inhibit the performance of both COX-1 and COX-2, and have the additional benefit of reducing the risk of developing cardiovascular disease, which is something RA sufferers are susceptible to. Omega-3 is easily found in fish oil. However, the American College of Rheumatology (ACR) does not currently recommend taking fish oil supplements, due to their lack of regulations. Fortunately, omega-3 is found naturally in the meat of fish. It’s also much tastier if consumed this way. Additionally, it can be found in eggs, flaxseed, kiwi, pecans, and hazelnuts. Many supermarket foods are artificially fortified with omega-3, so be sure to check the labels to ensure you’re getting it from a natural source. The FDA suggests a maximum daily intake of three grams of omega-3. Preliminary research shows flavonoids (once called vitamin P back in the 1940s) can inhibit COX-2. Flavonoids’ widespread presence in many plants and foods makes it easy to find. You’re probably already consuming a large intake on a regular basis and don’t even know it! Foods with high flavonoid levels include most berries, onions, green and oolong teas, bananas, all citrus fruits, red wine, and dark chocolate with a 70% or higher cocoa content. They’re so ubiquitous that it’d be harder to make a diet without flavonoids than with them! While the anti-inflammatory benefits of flavonoids aren’t as clear as with omega-3, the ease of incorporating flavonoids into your rheumatoid arthritis diet means there is no real reason not to include them. Technically, it’s calcitriol (one of vitamin D’s components) that is known to significantly block the expression of COX-2. While calcitriol can be taken as a supplement, its presence in vitamin D means this usually isn’t necessary. As a result, it is generally discouraged, since calcitriol supplements can cause hypocalcaemia. Vitamin D is produced naturally by the body when exposed to sunlight, but a few foods also contain it. Portobello and shiitake mushrooms have variable vitamin D levels based on how much sunlight they get. Alfalfa and fatty fish can also serve as additional sources. There’s no set value for recommended vitamin D, because the amount your body receives will change based on how much sunlight you get. It’s best to consult with a doctor before taking steps to increase your vitamin D intake, whether through diet or supplements. While there are foods that can help ease and reduce inflammation for those with rheumatoid arthritis, there are also foods you should avoid so you don’t make your RA symptoms worse. Unfortunately, information on what to cut out of your arthritis diet can be vague and sometimes contradictory. There isn’t always clear science on how different foods can cause inflammation. So, if you choose to forgo any of the following, be sure to monitor your symptoms to see if and how much it helps. While rheumatoid arthritis is not directly linked to obesity, being overweight puts more strain on your body’s joints. Sugary snacks and soft drinks are also low in nutritional value. While they might not hurt, they don’t help much either. In addition, saturated fats contain arachidonic acid, which aggravates existing inflammation. Removing saturated fats, high fructose corn syrup, and the like from your arthritis diet can help keep your condition manageable. Although they are not a food, a cigarette is a consumed substance that is still best avoided. In addition to the obvious health risks, smokers with RA have more swollen joints and are twice as likely to suffer joint damage. This is one of the more controversial foods with regard to how it affects RA. Depending on what research you consult, decaf may promote inflammation. Tea can reduce RA symptoms, whereas regular coffee doesn’t particularly do anything noticeable. What is known, however, is that coffee can sometimes interact with certain arthritis medications and reduce their level of effectiveness. If you’re on any medications, check with your doctor about whether it has known interactions with coffee. If you’re not on medications, it doesn’t hurt to try a coffee-free arthritis diet and see how it affects you. Advanced Glycation End products (AGEs) are a type of substance that can adhere to body tissue and oxidize. Your body responds by releasing cytokines, an inflammatory agent. AGEs occur naturally when meat is heated at high temperatures. So, a good RA diet will forgo things like grilled hamburgers or charbroiled steaks. Meats cooked at lower temperatures in the rare to medium-rare range have significantly lower AGE levels. If you can’t resist meat completely, go for the pink center. This is an example of another toss-up. Milk, as well as all dairy products, contains a protein called casein. Some people have an intolerance to casein where ingesting it causes joint swelling. On the other hand, milk is also a source of vitamin D, which is known to have anti-inflammatory effects. Do some personal experimenting and see whether milk and dairy qualify as part of an arthritis diet for you, or whether it is a food product you should avoid. Believe it or not, alcohol in moderation not only reduces the risk of developing RA, but it has been shown in several cases to lead to less severe symptoms. So, why are you being told to avoid it? Alcohol can ignite a number of drug interactions, so it’s best to skip drinking until clearing it with your doctor. An excessive salt intake can cause high blood pressure, raising the chance of an RA flare-up. It’s therefore best to stick to moderate or minimal salt levels in your arthritis diet. Omega-6 fatty acids strengthen the ability of COX-1 and COX-2 to cause inflammation. The extent to which omega-6 contributes to inflammation actually depends on the ratio between it and omega-3 in your body—the closer the levels are, the more they cancel each other out. Therefore, reducing your omega-6 intake will help improve the anti-inflammatory effects of any omega-3 you eat. Omega-6 is found commonly in corn, soybean, sunflower, and rapeseed oils. These are often used in processed foods, so be wary when exploring the supermarket aisle. People with lactose intolerance, celiac disease, or other sensitivities or allergies can experience RA flare-ups when eating the associated foods. If you suffer regular flare-ups after eating certain foods, your diet can do without them. Food is, unfortunately, not the easiest route to take when trying to address rheumatoid arthritis. There is no special nutrient that can cure arthritis, nor is there anything you should unquestionably avoid to become symptom-free. 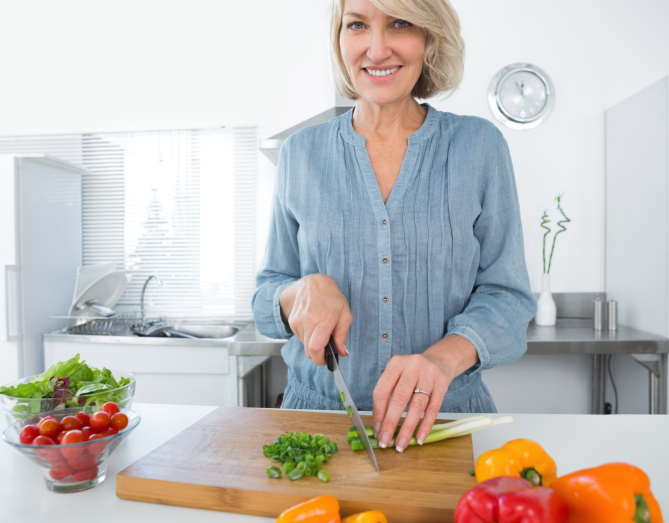 However, an ideal arthritis diet is one that is low in saturated fat, has about two servings of fish per week, and incorporates nuts, eggs, onions, and citrus fruits. Fortunately, there are other things you can do to ease the pain of arthritis, like staying active while avoiding overexertion, which is vital for keeping your muscles and joints strong. This also helps with maintaining bone strength and makes it easier to rest. Range-of-motion exercises like rolling your shoulders back or raising your arms above your head should be done regularly. Aerobics are also useful for improving cardiovascular health and blood flow. Since stress is linked to RA flare-ups, taking time out of your day for calming activities, like reading or yoga, is important. It’s also useful to have friends or family who can help you with tasks during flare-ups. Knowing your body and helping it stay strong through activity, support, and a healthy arthritis diet is the best thing for minimizing symptoms and keeping arthritis from taking over your life. Albert, D, et al., “Hyperforin is a dual inhibitor of cyclooxygenase-1 and 5-lipoxygenase,” Biochemical Pharmacology 2002; 64(12): 1767-1775.Cleland, L.G., et al., “The role of fish oils in the treatment of rheumatoid arthritis,” Drugs 2003; 63(9): 845-853. “Foods and Arthritis,” Physicians Committee for Responsible Medicine web site; http://www.pcrm.org/health/health-topics/foods-and-arthritis, last accessed May 11, 2015. “Foods That Fight Inflammation,” Arthritis Foundation web site; http://www.arthritis.org/living-with-arthritis/arthritis-diet/anti-inflammatory/eat-to-beat-inflammation.php, last accessed May 11, 2015. “Foods to Avoid with Arthritis,” Healthline web site, March 5, 2013; http://www.healthline.com/health-slideshow/foods-to-avoid-with-arthritis. Gardner, A., “Best and worst foods for pain,” Fox News web site, December 13, 2012; http://www.foxnews.com/health/2012/12/12/best-and-worst-foods-for-pain/. Paturel, A., “The Ultimate Arthritis Diet,” Arthritis Foundation web site; http://www.arthritis.org/living-with-arthritis/arthritis-diet/anti-inflammatory/the-arthritis-diet.php, last accessed May 11, 2015.